Wildfire season is fast approaching – and in some areas of British Columbia, has already begun. Sooke Fire/Rescue is gearing up for another busy wildfire season through training efforts and apparatus, supplies and equipment preparation. Mitigation efforts by individual property owners in Sooke can significantly reduce wildfire risk, so we need your help! Protecting your home from wildfires starts with some simple actions. 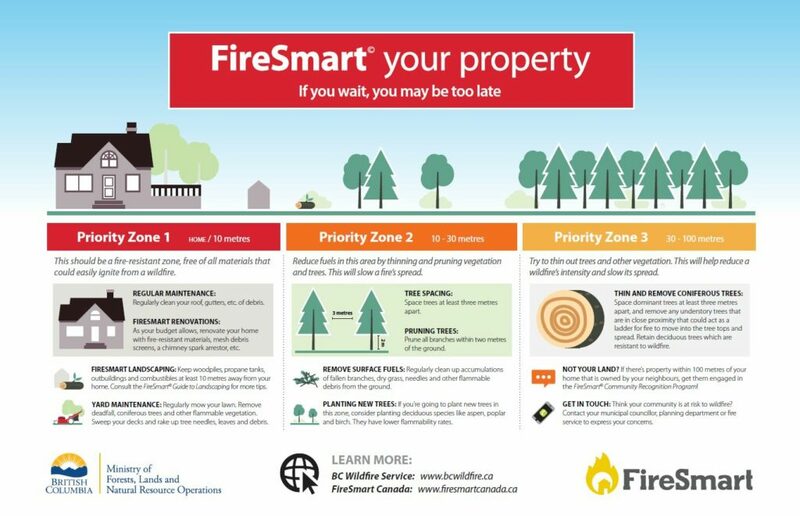 Learn the Steps for Creating a FireSmart Property before the hot, dry summer is upon us. A resilient community is a safe community. Pick up helpful resources at Sooke Fire/Rescue, and learn more at FireSmart Canada. Know your hazard – take the assessment on the FireSmart website or book an onsite consultation with Sooke Fire/Rescue. Take action. Some of the measures cost very little and will reduce the vulnerability of your home. Have a FireSmart discussion with your neighbours and plan the work together. Make at least one FireSmart commitment! For example, make sure that every house in your neighbourhood has eaves that are clean and free of debris. Hold a follow-up meeting to see how your neighbours are progressing with collective goals. Celebrate your activities – you are helping prevent the spread of wildfires! Contact Sooke Fire/Rescue to help facilitate discussions and provide an onsite assessment of your property.